"Red Rock Canyon". This photograph was taken near sunset at the Red Rock Canyon National Conservation Area in Nevada. Located just 15 miles from the Las Vegas Strip this is one of the most popular tourist destinations for visitors to this famous city. 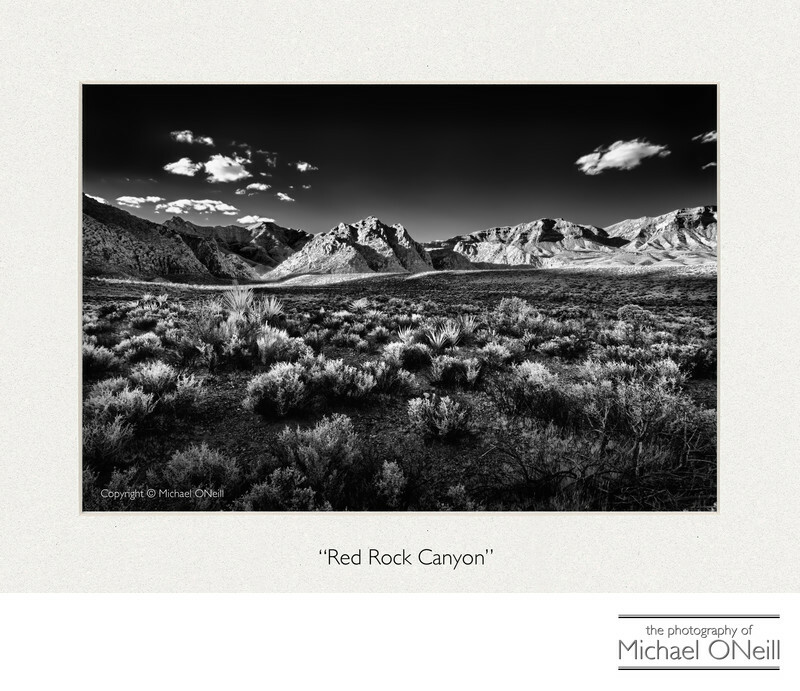 This black and white study of the desert location was made with a Nikon DSLR camera converted for infrared capture. Back in the photographic film days any SLR camera could make an infrared capture however it was a cumbersome process involving the use of specialty film emulsions and dark infrared filters over the cameras lens that would only allow the transmission of infrared light wavelengths to expose your film. One would have to focus the image with no filters in place, make a manual focus compensation for the infrared capture, put the filter(s) in place and make a long exposure with the camera mounted on a sturdy tripod. The digital age has made infrared capture easier in that most popular DSLR cameras can be easily, though expensively, modified for infrared capture. The major drawback in digital infrared capture is the cost. The conversion of the camera is expensive and non-reversible. In other words the digital camera will be good for infrared capture only once converted, thereby being rendered useless for conventional photography. The look of infrared photographs is remarkable. Blue skies are rendered black and the white clouds dramatically stand out from those black skies. Vegetation is rendered in assorted gray to white tones. This image was captured on a side trip during my annual trip to Las Vegas for the Wedding and Portrait Photographers International conference and trade show. Every year I try to schedule a day or two to photograph some extraordinary locations in the desert southwest. Elsewhere on this web site you will find fine art photographs made at Zion National Park in Utah and The Antelope Slot Canyons in Page Arizona. All of these images are part of my body of work offered as collectible fine art photography editions.